It’s not easy to find cross training shoes for flat feet but it’s something that you have to do if you want a pain-free, effective workout. There are so many kinds of athletic shoes out there, it’s hard to even know where to start looking so we researched some of the best-selling sneakers around and put together this review of top cross training shoes for flat feet. Before we get started, let’s take a look at some of the key things to keep in mind. Rubber Sole: Most of these shoes have rubber soles. In fact, we only included one that doesn’t. Rubber soles are great for providing traction and grip but there are a lot of synthetic materials that can do the job, too. 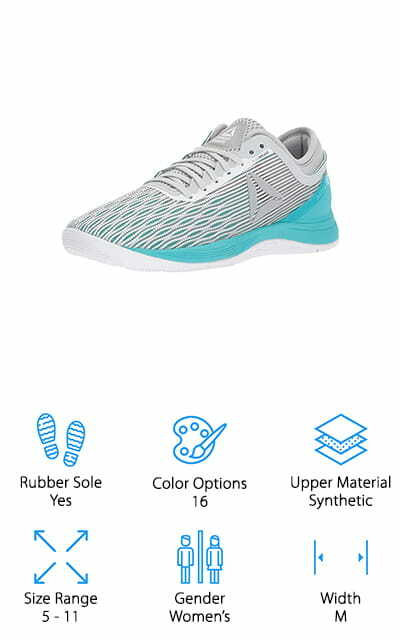 Color Options: Obviously, the color of a shoe doesn’t affect how well it performs but having a pair of shoes in a color that you love can be the motivation you need to get up and get moving. Upper Material: These uppers vary a bit from leather to mesh to synthetic textiles. Leather tends to be a little more durable while mesh and textile shoes have a bit more flex and let your feet breathe. Size Range: A lot of these shoes are available in a pretty wide range of sizes. In fact, we found men’s shoes as large as a size 18 and women’s as large as a size 12. Gender: We found a lot of great options for both men and women. While women’s shoes are designed for a woman’s foot, most men’s shoes can be worn by women without a problem, it’s important to get the sizing right. Width: There’s some variety when it comes to width. Some shoes are only available in standard width while some come in both wide and extra wide. Make sure you get the right fit to keep your workouts as comfortable as possible. Now that you know what to look for, let’s move right into our product reviews. If you’re in a hurry, check out our top and budget picks first. That’s the best way to see the range that’s available and we put them right at the top of the list so they’re easy to find. Stick around if you can, though, we really found a wide variety of options and you never know which one will be right for you. Alright, let’s get started. Our top pick is the best men's cross training shoes for flat feet, the Reebok Nano 8.0 Cross Trainer. First of all, they’re really comfortable. The Flexweave upper is super durable and is really comfortable while also being secure and supportive. It also features a wide toe box for ease of movement while still providing the support you need for training. That’s not all, the toe area also features Toe Tection for added durability during your most intense workouts. A minimal drop outsole provides just the right kind of support and the newly designed heel bootie makes sure you have the right amount of stability and comfort. One more thing, these shoes also have RopePro which provides the maximum traction and protection you need during rope climbs. Next is our budget pick, the New Balance Men’s Cross Trainer. These shoes have a 100% leather upper with a dual density collar and a mesh padded tongue to prevent any uncomfortable rubbing or chafing during training. Increased flexibility in the forefoot provides greater precision and the enhanced heel cushioning and adzorb midsole provide both extreme comfort and the right amount of support. A lace-up closure and heel pull-tab make it really easy to get these shoes on and adjusted to the perfect fit. They come in a really inclusive size range, too, from 6.5 to 18 including widths from medium to extra-wide. That’s not all, there are 20 different color combinations including classic colors like white, black, and blue and even a camouflage pattern. The PUMA Tazon Cross-Trainer Shoe is up next and it’s our pick for the best women's cross training shoes for flat feet. They feature a sleek, streamlined design that provides snug support for even high-intensity workouts. They have an EVA heel to absorb impact and a TPU shank for additional stability and support. That’s not all, the midfoot saddle helps you get just the right fit and inside there’s a breathable EcoOrthoLite sockliner for optimal fit and comfort. In addition to being practical for cross-training, these shoes also have a really sleek style. The black layered textures create an interesting look and the hot pink accents add just the right pop of color. 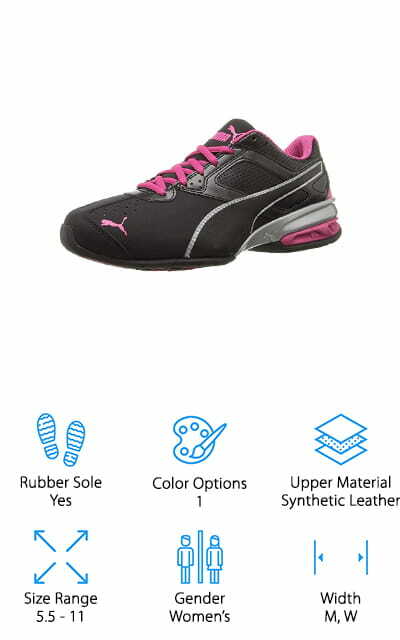 These shoes are available in a wide range of women’s sizes in medium and wide widths. Another great pair of women's cross training shoes for flat feet are the Nike Metcon 3 Training Shoes. What makes them great for running and cardio drills is the updated drop-in midsole. It’s soft and really flexible in the midfoot which makes it ideal for running and cardio drills. If you’re looking for shoes for lifting, these are great, too, thanks to the firm-rubber heel and flat platform support. The uppers are made of lightweight, breathable mesh that is really comfortable but they also have embroidered reinforcement in high-wear areas so they’’re tough enough to endure intense training. That’s not all, they also have a flywire closure that helps keep your foot locked in place during even the most intense workouts. These shoes are available in women’s sizes 5 to 12 and come in 24 different colors. Next up are the Under Armour Push Cross-Trainer Shoe. These women’s cross-trainers have an embroidered textile upper that’s breathable and delivers directional support and strength. It includes dynamic webbing that loops around the foot, hugging it snugly to enhance fit while remaining really comfortable. A rubber forefoot sidewall provides traction and stability for quick movements and the full-length EVA sockliner is really comfortable and helps you get a custom fit. That’s not all, the midsole features Charged Cushioning technology that absorbs impact and helps you make quick rebounds. These women’s shoes are available in a wide range of sizes from 5 to 12 in medium width. They’re also available in 8 different color combinations that range from subtle designs to those that make more of a statement with bright pinks, blues, and reds. 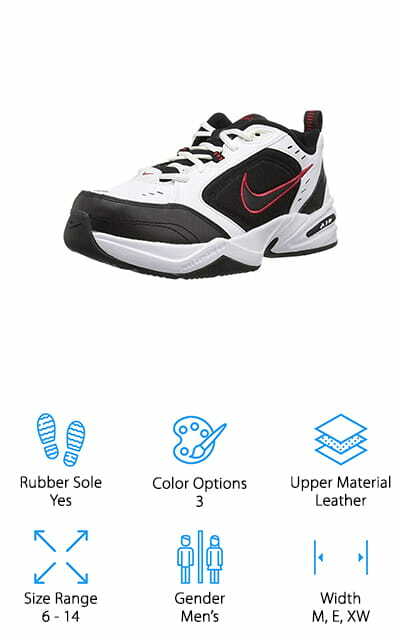 One pair of the best cross training shoes for flat feet men love is the NIKE Air Monarch IV Cross Trainer. This shoe has a leather upper with overlays for added support and structure as well as perforations to keep air flowing around your foot as you train. Inside, the full-length encapsulated Air-Sole cushions your foot and keeps it comfortable and supported. The solid rubber outsole is super thick and durable plus it provides adequate traction over a range of different surfaces. 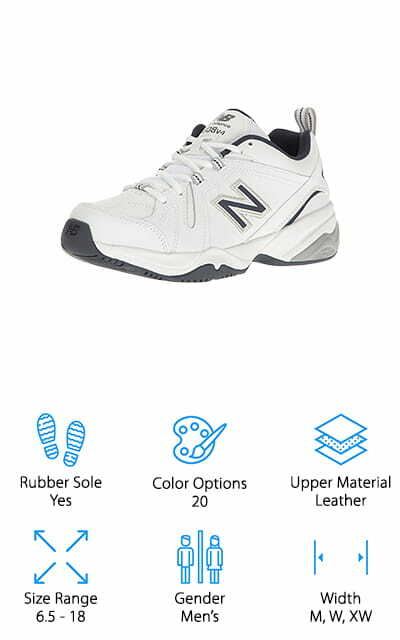 These men’s trainers are available in sized 6 to 14 and come in M, E, and XW. If you have wide feet and have a hard time finding training shoes that fit right, these are a really great option. They’re available in 3 different color combinations. PUMA Men’s Taxon 6 Cross-Trainer Shoe is a low-top shoe that’s a great run-train performance sneaker. The paneled synthetic upper has a midfoot saddle and a lace closure so you get a supportive, adjustable fit across the top of your foot that provides stability and comfort. 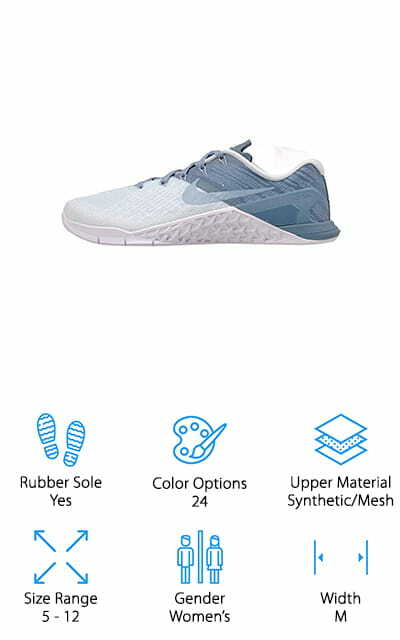 Inside, there’s a breathable EcoOrtthLit sockliner and an EVA heel pad that add cushioning and shock absorption as well as a TPU shank for better stability. There are a few different color combinations available, too. 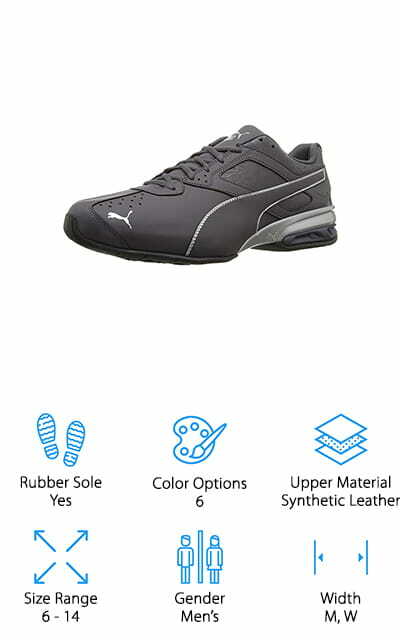 All feature the recognizable PUMA logo on the tongue and medial side as well as the lateral formstrip. Most of the designs feature a modern fracture graphic on the top and side panel of the shoe. It’s a cool detail that adds just a bit of contrast without overwhelming the sleek, simple design. If you’ve been waiting for the Asics cross-training shoes for flat feet, you’re in luck. The Gel-Craze Cross-Trainer is up next. 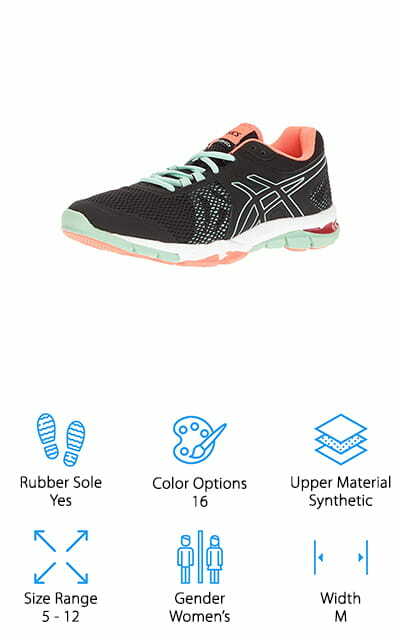 They feature a fuzrGEL Midsole that’s made of ASICS’s new cushioning technology, a material that’s a fusion of gel and foam that provides lightweight comfort, shock absorption, and forefoot bounce back. 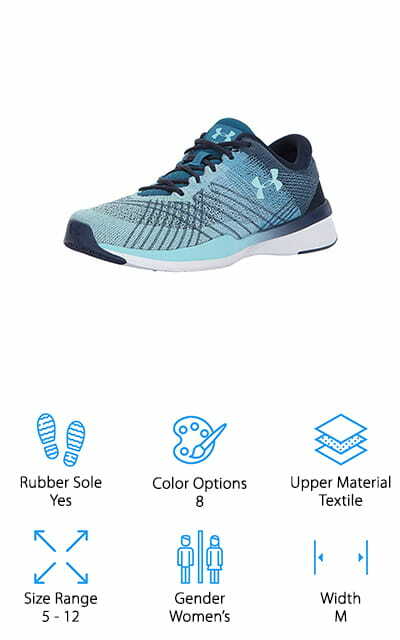 That’s not all, there’s also an ultra-lightweight Solyte midsole that adds extra cushioning and durability plus rearfoot gel that protects against hard impact. The outsole features high abrasion rubber in high wear areas that add extra durability. These shoes are available from sizes 5 to 12 so they’re a great choice for women who have a hard time finding large sizes. That’s not all, they come in 16 different color options, too, so you can find one that matches your style. Next up is the Reebok CROSSFIT Nano 80 Trainer, a great low-top show with a new heel bootie construction for ultimate comfort. These shoes are lightweight and flexible and they allow your feet to breathe so they’re great for intense workouts. Toe Tection technology provides durability in the toe area so they’ll stand up to a lot of wear and tear. That’s not all, the minimal drop outsole helps keep your foot secure while the wide toe box prevents any pinching or rubbing during intense movements. These shoes are available in women’s sized 5 to 12. They also come in 16 different color combinations. What’s really cool about these shoes is that each color combination has its own character so much so that they often look like different shoes altogether! Another pair of the best cross training shoes for flat feet women’s needs is the RYKA Vida RZX Cross-Training Shoe. The lace-up design features breathable mesh underlays with large overlays running down each side of the foot. There’s a tie closure to make sure you get just the right amount of support and stability. The padded tongue and collar are really comfortable, too, and the precise-return footbed is perfect for low arches. Because these shoes are specifically made for women, they were designed with a narrower heel, larger forefoot, and a more secured footbed for targeted support. These shoes are available in sizes 5 to 11 and are available in 4 different color schemes. All of them are really bright and have colors that pop. This shoe will surely get you noticed.